Soil organisms represent a large fraction of global terrestrial biodiversity. They carry out a range of processes important for soil health and fertility in soils of both natural ecosystems and agricultural systems. This annex provides brief descriptions of organisms that are commonly found in the soil and their main biological and ecological attributes. The community of organisms living all or part of their lives in the soil constitute the soil food web. The activities of soil organisms interact in a complex food web with some subsisting on living plants and animals (herbivores and predators), others on dead plant debris (detritivores), on fungi or on bacteria, and others living off but not consuming their hosts (parasites). Plants, mosses and some algae are autotrophs, they play the role of primary producers by using solar energy, water and carbon (C) from atmospheric carbon dioxide (CO2) to make organic compounds and living tissues. Other autotrophs obtain energy from the breakdown of soil minerals, through the oxidation of nitrogen (N), sulphur (S), iron (Fe) and C from carbonate minerals. Soil fauna and most fungi, bacteria and actinomycetes are heterotrophs, they rely on organic materials either directly (primary consumers) or through intermediaries (secondary or tertiary consumers) for C and energy needs. A food-web diagram shows a series of conversions (represented by arrows) of energy and nutrients as one organism eats another. The structure of a food web is the composition and relative numbers of organisms in each group within the soil. The living component of soil, the food web, is complex and has different compositions in different ecosystems. In a healthy soil, there are a large number of bacteria and bacterialfeeding organisms. Where the soil has received heavy treatments of pesticides, chemical fertilizers, soil fungicides or fumigants that kill these organisms, the beneficial soil organisms may die (impeding the performance of their activities), or the balance between the pathogens and beneficial organisms may be upset, allowing those called opportunists (disease-causing organisms) to become problems. The easiest and most widely used system for classifying soil organisms is by using body size and dividing them into three main groups: macrobiota, mesobiota and microbiota (Wallwork, 1970; Swift, Heal and Anderson, 1979). The ranges that determine each size group are not exact for all members of each group. These are the smallest organisms (<0.1 mm in diameter) and are extremely abundant and diverse. They include algae, bacteria, cyanobacteria, fungi, yeasts, myxomycetes and actinomycetes that are able to decompose almost any existing natural material. Micro-organisms transform organic matter into plant nutrients that are assimilated by plants. Two main groups are normally found in agricultural soils: bacteria and mycorrhizal fungi. Bacteria are very small, one-celled organisms that can only be seen with a powerful light (1 000×) or electron microscope. They constitute the highest biomass of soil organisms. They are adjacent and more abundant near roots, one of their food resources. There are many types of bacteria but the focus here is on those that are important for agriculture, e.g. Rhizobium and actinomycetes. Bacteria are important in agricultural soils because they contribute to the carbon cycle by fixation (photosynthesis) and decomposition. Some bacteria are important decomposers and others such as actinomycetes are particularly effective at breaking down tough substances such as cellulose (which makes up the cell walls of plants) and chitin (which makes up the cell walls of fungi). Land management has an influence on the structure of bacterial communities as it affects nutrient levels and hence can shift the dominance of decomposers from bacterial to fungal. One group of bacteria is particularly important in nitrogen cycling. Free-living bacteria fix atmospheric N, adding it to the soil nitrogen pool; this is called biological nitrogen fixation and it is a natural process highly beneficial in agriculture. Other Nfixing bacteria form associations (in the form of nodules) with the roots of leguminous plants (Box A1.1). The nodule is the place where the atmospheric N is fixed by bacteria and converted into ammonium that can be readily assimilated by the plant. The process is rather complicated but, in general, the bacteria multiply near the root and then adhere to it. Next, small hairs on the root surface curl around the bacteria and they enter the root. Alternatively, the bacteria may enter directly through points on the root surface. Once inside the root, the bacteria multiply within thin threads. Signals stimulate cell multiplication of both the plant cells and the bacteria. This repeated division results in a mass of root cells containing many bacterial cells. Some of these bacteria then change into a form that is able to convert gaseous N into ammonium nitrogen (they can fix N). These bacteria are then called bacteroids and present different properties from those of free cells. Most plants need very specific kinds of rhizobia to form nodules. A specific Rhizobium species will form a nodule on a specific plant root, and not on others. 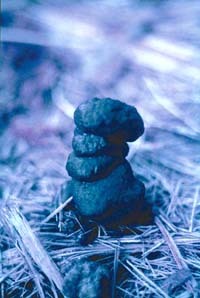 The shapes that the nodules form are controlled by the plant and nodules can vary considerably in size and shape. The nodulation process is a series of events in which rhizobia interact with the roots of legume plants to form a specialized structure called a root nodule. Different types of nodules on leguminous roots: (1) soybean; (2) alfalfa; (3) pea; and (4) white clover (Soltner, 1978). Actinomycetes are a broad group of bacteria that form thread-like filaments in the soil. The distinctive scent of freshly exposed, moist soil is attributed to these organisms, especially to the nutrients they release as a result of their metabolic processes. Actinomycetes form associations with some non-leguminous plants and fix N, which is then available to both the host and other plants in the near vicinity. Bacteria produce (exude) a sticky substance in the form of polysaccharides (a type of sugar) that helps bind soil particles into small aggregates, conferring structural stability to soils. Thus, bacteria are important as they help improve soil aggregate stability, water infiltration, and water holding capacity. However, in general their effect is less marked than that originated by large invertebrates such as earthworms. Decomposers - saprophytic fungi - convert dead organic material into fungal biomass, CO2, and small molecules, such as organic acids. These fungi generally use complex substrates, such as the cellulose and lignin, in wood. They are essential for decomposing the carbon ring structures in some pollutants. Like bacteria, fungi are important for immobilizing or retaining nutrients in the soil. Mutualists - mycorrhizal fungi - colonize plant roots through a symbiotic relationship. The definition of symbiosis is a close, prolonged association between two or more different organisms of different species that may benefit each member. Mycorrhizae increase the surface area associated with the plant root, which allows the plant to reach nutrients and water that otherwise might not be available. Mycorrhizae essentially extend plant reach to water and nutrients, allowing plants to utilize more of the resources available in the soil. Mycorrhizae source their carbohydrates (energy) from the plant root they are living in/on and they usually help the plants by transferring phosphorus (P) from the soil into the root. 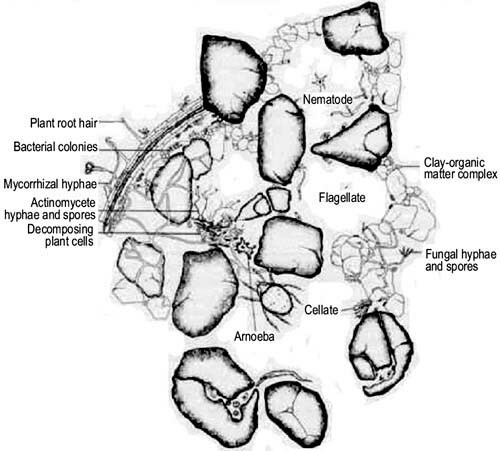 Two major groups are identified: (i) ectomycorrhizae, that grow on the surface layers of the roots and are commonly associated with trees; and (ii) endomycorrhizae, such as arbuscular mycorrhizal fungi and vesicular mycorrhizal fungi, that grow within the root cells and are commonly associated with grasses, row crops, vegetables and shrubs. Arbuscular mycorrhizal fungi can also benefit the physical characteristics of the soil because their hyphae form a mesh to help stabilize soil aggregates. Vesicular-arbuscular mycorrhizae are the most widespread mycorrhizal fungi. Mycorrhizae are particularly important for phosphate uptake because P does not move towards plant roots easily. These organisms do not harm the plant, and in return, the plant provides energy to the fungus in the form of sugars. The fungus is actually a network of filaments that grows in and around the plant root cells, forming a mass that extends considerably beyond the root system of the plant (Figure A1.2). Pathogens or parasites cause reduced production or death when they colonize roots and other organisms. Root-pathogenic fungi, such as Verticillium, Pythium and Rhizoctonia, cause major economic losses in agriculture each year. Many fungi help control diseases, e.g. nematode-trapping fungi that parasitize disease-causing nematodes, and fungi that feed on insects may be useful as biocontrol agents. The microfauna (<0.1 mm in diameter) includes inter alia small collembola and mites, nematodes and protozoa that generally live in the soil water films and feed on microflora, plant roots, other microfauna and sometimes larger organisms (e.g. entomopathogenic nematodes feed on insects and other larger invertebrates). They are important to release nutrients immobilized by soil microorganisms. 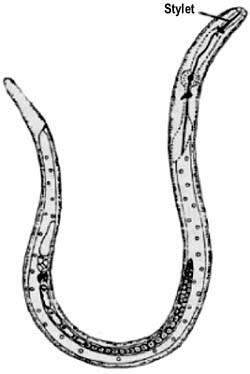 Nematodes are tiny filiform roundworms that are common in soils everywhere. They may be free-living in soil water films; beneficial for agriculture or phytoparasitic (Figure A1.3), and live at the surface or within the living roots (parasites). Free-living nematodes graze on bacteria and fungi, thus they control the populations of harmful micro-organisms. These nematodes are 0.15-5 mm long and 2-100 ìm wide; an exception are Mermithidae nematodes, which may be 20 cm long and are very common in tropical soils, being parasites of some arthropods such as locusts. Nematodes can only move through the soil where a film of moisture surrounds the soil particles. They live in the water (they are hydrobionts) that fills spaces between soil particles and covers roots. In hot and dry conditions, they enter into a dormant stage, and as soon as water becomes available, they spring back to activity. Nematodes are recognized as a major consumer group in soils, generally grouped into four to five trophic categories based on the nature of their food, the structure of the stoma (mouth) and oesophagus, and the method of feeding (Yeates and Coleman, 1982): bacterial feeders, fungal feeders, predatory feeders, omnivores, and plant feeders. The bacterial feeders prey on bacteria (bacterivores) and may ingest up to 5 000 cells/minute, or 6.5 times their own weight daily. This helps disperse both the organic matter and the decomposers in the soil. Bacterial- and fungal-feeding nematodes release a large percent of N when feeding on their prey groups and are thus responsible for much of the plant available N in the majority of soils (Ingham et al., 1985). The annual overall consumption may be as much as 800 kg of bacteria per hectare and the amount of N turned over in the range of 20-130 kg (Coleman et al., 1984). Phytophages or plant-feeding nematodes damage plant roots, with important economic consequences for farmers. They possess stylets with a wide diversity of size and structure, and they are the most extensively studied group of soil nematodes because of their ability to cause plant disease and reduce crop yield. Source: drawing by M. Brundrett, CSIRO. Mesofauna (0.1-2 mm in diameter) includes mainly microarthropods, such as pseudoscorpions, springtails, mites, and the worm-like enchytraeids. Mesofauna have limited burrowing ability and generally live within soil pores, feeding on organic materials, microflora, microfauna and other invertebrates. Collembola or springtails are microarthropods that live in the litter or in the pore space of the upper 10-15 cm of soil. They are saprophagous and feed mainly on fungi, bacteria and algae growing on decomposing plant litter (Ponge, 1991). They are important as epigeic decomposers. Unlike most insects, they have no wings at any stage. They measure a few millimetres in length (Figure A1.4) and elongate with a characteristic salutatory organ, a forked tail which enables them to spring when in danger. Springtails are probably the most abundant group of insects on Earth. Pseudoscorpions are tiny arachnids rarely longer than 8 mm. They live in litter, decaying vegetation, and the soil. Pseudoscorpions superficially resemble true scorpions, bearing relatively large chelae on the pedipalps, but they do not have a telson or stinger. Pseudoscorpions feed on very small arthropods such as springtails and mites. Members of species classed as macrofauna are visible to the naked eye (generally> 2 mm in diameter). Macrofauna includes vertebrates (snakes, lizards, mice, rabbits, moles, etc.) that primarily dig within the soil for food or shelter, and invertebrates (snails, earthworms and soil arthropods such as ants, termites, millipedes, centipedes, caterpillars, beetle larvae and adults, fly and wasp larvae, spiders, scorpions, crickets and cockroaches) that live in and feed in or upon the soil, the surface litter and their components. In both natural and agricultural systems, soil macrofauna are important regulators of decomposition, nutrient cycling, soil organic matter dynamics, and pathways of water movement as a consequence of their feeding and burrowing activities. Here the focus is on soil invertebrates. Epigeic: they live in the litter layers, a very changing environment, subject to drought, high temperatures and predator presence. These earthworms are generally small and pigmented (green or reddish) with rapid movements. Endogeic: these are unpigmented (with no colour) worms that live and feed in the soil. This group is further divided into three subgroups: oligohumic, mesohumic and polyhumic, depending on the organic matter content of the soil ingested. Anecic: these earthworms feed on the surface litter that they generally mix with soil, but they spend most of their time in the soil. They are large, with dark anterodorsal pigmentation, and they dig subvertical burrows. As a result of this wide range of adaptations, earthworms have diverse functions in the soil. Epigeic worms can be used as compost makers with no impact on soil structure. Anecics and endogeics do have an impact on soil structure owing to their mixing and burrowing activities, and on soil organic matter. Earthworms generally exert beneficial effects on plant growth. However, negative effects may be induced under particular situations. The effect on grain yields is also proportional to the earthworm biomass; significant effects start to appear at biomass values> 30 g fresh weight (Brown et al., 1999), although very high biomasses of single species of earthworms, (e.g. Pontoscolex corethrurus) may inhibit production under particular situations. Many mechanisms are involved in the growth stimulation. These vary from large-scale effects on soil structure and nutrient availability, to the enhancement of mycorrhizal infection or control of plant-parasitic nematodes. Once the earthworms are established, a dynamic cropping system - involving crop rotations with long cycle crops or perennials with good organic matter additions - contributes to securing long-lasting benefits from earthworm activities. Termites are important members of soil macrofauna in various regions of the world. They are social insects, living in organized colonies with a number of castes (different individuals) with a set of morphological and physiological specializations. The main castes are: queen (the termite that founds the colony), worker and soldier. Neither individual termites nor colonies normally travel long distances as they are constrained to live within their territorial border or within their food materials. A number of species feed on living plants and some may become serious pests in agricultural systems where dead residues are scarce (Wood, 1996). Most species feed on dead-plant materials above and below the soil surface. Their food sources include plant-decaying materials, dead foliage, woody materials, roots, seeds and the faeces of higher animals (Lavelle and Spain, 2001). There are also soil-wood feeders and soil feeders, which means that they ingest a high proportion of mineral material. Their nutrition derives mainly from well-decayed wood and partly humified soil organic matter. Another group of termites grow fungi in their nests (fungus-growing termites). The nests formed by termites may occur in different locations, e.g. within the wood of living or dead trees, in subterranean locations, in other nests formed by other termite species, and by forming epigeal nests (above the soil surface) and arboreal nests. Ants build a large variety of structures in the soil. However, because of their feeding habits, they are of less importance in regulating processes in the soil than termites or earthworms. Beetles (Coleoptera) are diverse taxonomically and differ widely in size and in the ecological role they perform in soil and litter. They are either saprophagous, phytophagous or predators. Two groups are of particular relevance in agricultural soils: larvae from the family Scarabeidae (dung-beetles), crucial to burying cowdung in natural savannahs and grasslands used for cattle grazing (e.g. in Africa); and Melolonthinae beetles, whose larvae may be abundant in grasslands and affect crop production by feeding on living roots (Villalobos and Lavelle, 1990). Dung beetles dig subvertical galleries 10-15 mm wide down to a depth of 50-70 cm with a variable number of chambers, which are further filled with large pellets of dung. The adult beetle lays one egg in each chamber and then the larva feeds on the pellet to complete the cycle (Lavelle and Spain, 2001). They generally give rise to small mounds a few centimetres high on the soil surface (Hurpin, 1962). Biogenic structures are those structures created biologically by a living organism. Three main groups of biogenic structures are commonly found in agricultural systems: earthworm casts and burrows, termite mounds and ant heaps. The biogenic structures can be deposited in the soil surface and in the soil, and generally they have different physical and chemical properties from the surrounding soil. The colour, size, shape and general aspect of the structures produced by large soil organisms can be described for each species that produces it. The form of the biogenic structure can be likened to simple geometric forms in order to facilitate evaluation of the volume of soil moved through each type of structure on the soil surface. Earthworm casts vary in size depending on the size of the earthworm that produces them. They range from a few millimetres to several centimetres in diameter, weighing from only a few grams to more than 400 g.
Granular casts (Plate A1.1) are very small and formed by isolated faecal pellets (Lee, 1985). These casts can be found on the soil surface or within the soil, and are generally produced by epigeic earthworms. Globular casts are larger and formed by large aggregates (Lee, 1985). These are normally produced by endogeic and anecic earthworms. 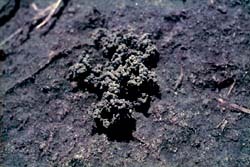 The casts produced by anecic earthworms comprise an accumulation of somewhat isolated round or oval-shaped pellets (one to several millimetres in diameter) which may coalesce into paste-like slurries that form large structures. Hence, casts are large in size, towerlike, and made of superposed layers of different ages, the older (i.e. dry and hard) located at the base and the younger (i.e. fresh and soft) on the top (Plate A1.2). Casts produced by anecic earthworms have a higher proportion of organic matter, especially large particles of plant material, and a larger proportion of small mineral components than in the surrounding soil. Granular casts on the soil surface of an African soil. Globular casts deposited by an African earthworm. Earthworms construct burrows or galleries (Plate A1.3) through their movement in the soil matrix. The type and size of the galleries depends on the ecological category of earthworm that is producing it. Anecic earthworms create semi-permanent subvertical galleries, while endogeic worms dig rather horizontal burrows. These galleries may be filled with casts, which can be split into smaller aggregates by other smaller earthworms or soil organisms. Galleries are cylindrical and their wall area coated with cutaneous mucus each time the worm passes through. Soil micro-organisms (bacteria) are markedly concentrated at the surface of the gallery walls and within the adjacent 2 mm of the surrounding soil. This microenvironment comprises less that 3 percent of the total soil volume but contains 5-25 percent of the whole soil microflora and is where some functional groups of bacteria predominate (Lavelle and Spain, 2001). Termite mounds are among the most conspicuous structures in savannah landscapes. Termite mounds are of diverse types and are the epigeal part of a termite nest that originates from subterranean beginnings. In Africa, termites build up half of the biomass of the plains. Termites process high quantities of material in their building activities, thus influencing the soil properties as compared with surrounding soils (Lee and Wood, 1971). Soil texture and structure are modified strongly in termite mounds. 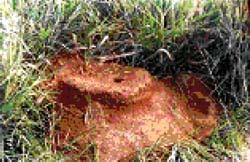 In general, the soil of the termite mounds exhibits a higher proportion of fine particles (clay), which termites transport from the deeper to upper soil horizons. The tropical American genera Acromyrmex and Atta leaf-cutting ants (Plate A1.4) make subterranean nests and their leaf harvesting may lead to enormous incorporations of organic matter and, hence, nutrients into the soil. Although not generally considered soil organisms, roots grow mostly within the soil and have wide-ranging, long-lasting effects on both plant and animal populations aboveground and belowground, and thus they are included among soil biota. Earthworm galleries (burrows) provide an easy pathway for roots to take as they grow through the soil (Plate A1.3). Some of them are pathogenic and can attack plant roots. Agricultural practices can have either positive or negative impacts on soil organisms. Land management and agricultural practices alter the composition of soil biota communities at all levels, with important consequences in terms of soil fertility and plant productivity. There are examples of both positive and negative effects of some groups of soil organisms, particularly micro-organisms, phytoparasites/pathogens or rhyzophages, plant roots, and macrofauna on plant production. Deposits of soil by a fungus-growing ant in the Colombian Llanos. The different agricultural practices used by farmers also exert an important influence on soil biota, their activities and diversity. Clearing forested or grassland for cultivation has a drastic effect on the soil environment and, hence, on the numbers and kinds of soil organisms. In general, such activity reduces the quantity and quality of plant residues and the number of plant species considerably. Thus, the range of habitats and foods for soil organisms is reduced significantly. Through changing the physical and chemical environment, agricultural practices alter the ratio of different organisms and their interactions significantly, for example, through adding lime, fertilizers and manures, or through tillage practices and pesticide use. N fixation into forms usable by higher plants. However, other soil organisms are detrimental or harmful to plant production. For example ants, aphids and phytophagous nematodes can be serious pests, and some micro-organisms, bacteria and actinomycetes cause also plant diseases. However, most damage is caused by fungi, which account for most soil-borne crop diseases. Humans generally begin their influence on soil biodiversity with naturallypresent communities at a particular site (resulting essentially from ecological and evolutionary forces). However, they also have the ability to introduce new organisms and, through imposition of different management practices, put selective pressures on the naturally present or introduced soil biota. This provides the opportunity to manage soil organisms and their activities in order to enhance soil fertility and crop growth. Although probably enough is known in theory to manage these communities, considerable basic and applied research is required in order to achieve appropriate levels of biological husbandry and optimal management of these biological resources. Bouché, M.B. 1977. Stratégies lombriciennes. Ecol. Bull., 25: 122-132. Brown, G.G., Pashanasi, B., Gilot-Villenave, C., Patrón, J.C., Senapati, B.K., Giri, S., Barois, I., Lavelle, P., Blanchart. E., Blakemore, R.J., Spain, A.V. & Boyer, J. 1999. Effects of earthworms on plant production. In P. Lavelle, L. Brussaard & P.F. Hendrix, eds. Earthworm management in tropical agroecosystems, pp. 87-147. Wallingford, UK, CAB International. FAO. 2000. Guidelines and reference material on integrated soil and nutrient management and conservation for farmer field schools. 164 pp. Hurpin, B. 1962. Super-Famille des Scarabeoidea. In A.S. Balachowsky, ed. Entomologie appliquée à lAgriculture. Tome I. Coléoptères, pp. 24-204. Paris, Masson. Ingham, R.E., Trofymov, J.A., Ingham, E.R. & Coleman, D.C. 1985. Interactions of bacteria, fungi and their nematode grazers: effects on nutrient cycling and plant growth. Ecol. Mono., 55: 119-140. Lavelle, P. 1981. Strategies de reproduction chez les vers de terre. Acta Oecol., 2: 117-133. Lavelle, P. & Spain, A. 2001. Soil ecology. Dordrecht, Netherlands, Kluwer Academic Publishers. Lee, K.E. 1985. Earthworms: their ecology and relationships with soils and land use. New York, USA, Academic Press. 411 pp. Lee, K.E. & Wood, T.G. 1971. Termites and soils. London, Academic Press. Ponge, J.F. 1991. Food resources and diets of soil animals in a small area of Scots Pine litter. Geoderma, 49: 33-62. Soltner, D. 1978. Phytotechnie Générale. Les bases de la production vegetale. Tome 1, Le Sol. 7éme édition. Collection sciences et techniques agricoles. Angers. Swift, M.J., Heal, O.W. & Anderson, J.M. 1979. Decomposition in terrestrial ecosystems. Oxford, UK, Blackwell Scientific Publications. Villalobos, F.J. & Lavelle, P. 1990. The soil coleoptera community of a ropical grassland from Laguna Verde, Veracruz (Mexico). Rev. Ecol. Biol. Sol., 27(1): 73-93. Wallwork, J.A. 1970. Ecology of soil animals. London, UK, McGraw Hill. Wood, T.G. 1996. The agricultural importance of termites in the tropics. Agr. Zool. Rev., 7: 117-155. Yeates, W.G. & Coleman, D.C. 1982. Role of nematodes in decomposition. In D.W. Freckman, ed. Nematodes in soil ecosystems, pp. 55-80. Austin, USA, University of Texas Press. Organic matter affects both the chemical and physical properties of the soil and its overall health. Properties influenced by organic matter include: soil structure; moisture holding capacity; diversity and activity of soil organisms, both those that are beneficial and harmful to crop production; and nutrient availability. It also influences the effects of chemical amendments, fertilizers, pesticides and herbicides. Soil organic matter consists of a continuum of components ranging from labile compounds that mineralize rapidly during the first stage of decomposition to more recalcitrant residues (difficult to degrade) that accumulate as they are deposited during advanced stages of decomposition as microbial by-products (Duxbury, Smith and Doran, 1989). Freshly added or partially decomposed plant residues and their non-humic decomposition products constitute the labile organic matter pool. The more stable humic substances tend to be more resistant to further decomposition. The labile soil organic matter pool regulates the nutrient supplying power of the soil, particularly of nitrogen (N), whereas both the labile and stable pools affect soil physical properties, such as aggregate formation and structural stability. When crops are harvested or residues burned, organic matter is removed from the system. However, the loss can be minimized by retaining plant roots in the soil and leaving crop residues on the surface. Organic matter can also be restored to the soil through growing green manures, cuttings from agroforestry species and the addition of manures and compost. Soil organic matter is the key to soil life and the diverse functions provided by the range of soil organisms. Soil micro-organisms are of great importance for plant nutrition as they interact directly in the biogeochemical cycles of the nutrients. The roots of most plants are infected with mycorrhizae, fungi that form a network of mycelia or threads on the roots and extend the surface area of the roots. Source: Balota, Andrade and Colozzi Filho, 1996. In undisturbed soil ecosystems, e.g. in conservation agriculture, colonization with mycorrhizal fungi increases strongly with time compared with colonization under natural vegetation (Figure A2.2). 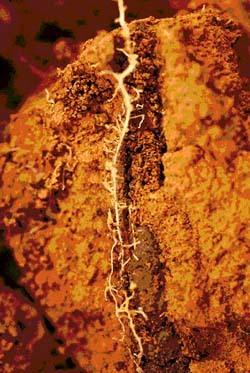 Fine roots are the primary sites of mycorrhizal development as they are the most active site for nutrient uptake. This partly explains the increase in mycorrhizal colonization under undisturbed situations as rooting conditions are far better than under conventional tillage. Other factors that might stimulate mycorrhizal development are the increase in organic carbon (C) and the rotation of crops with cover crop/green manure species. 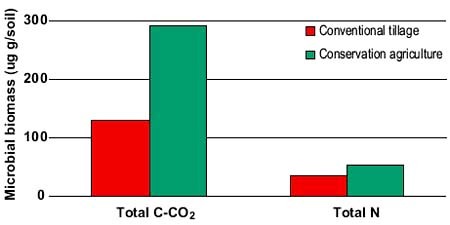 Source: Venzke Filho et al., 1999. Source: Gassen and Gassen, 1996. Another consequence of increased organic matter content is an increase in the earthworm population. Earthworms rarely come to the soil surface because of their characteristics: photophobia, lack of pigmentation and tolerance to periods of submergence and anaerobic conditions during rainfall. Soil moisture is one of the most important factors that determine the presence of earthworms in the soil. Through cover crops and crop residues, evaporation is reduced and organic matter in the soil is increased, which in turn can hold more water. Residues on the soil surface induce earthworms to come to the surface in order to incorporate the residues in the soil. The burrowing activity of earthworms creates channels for air and water; this has an important effect on oxygen diffusion in the rootzone, and the drainage of water from it. Furthermore, nutrients and amendments can be distributed easily and the root system can develop, especially in acid subsoil in the existing casts. The shallow-dwelling earthworms create numerous channels throughout the topsoil, which increases overall porosity, and thus bulk density (Figures A2.3). The large vertical channels created by deep-burrowing earthworms increase water infiltration under very intense rainfall conditions. Many important chemical properties of soil organic matter result from the weak acid nature of humus. The ability of organic matter to retain cations for plant use while protecting them from leaching, i.e. the cation exchange capacity (CEC) of the organic matter, is due to the negative charges created as hydrogen (H) is removed from weak acids during neutralization. Many acid-forming reactions occur continually in soils. Some of these acids are produced as a result of organic matter decomposition by microorganisms, secretion by roots, or oxidation of inorganic substances. Commonly used N fertilizers through microbial conversion of NH4+ to NO3-. In particular, ammonium fertilizers, such as urea, and ammonium phosphates, such as monoammonium and diammonium phosphate, are converted rapidly into nitrate through a nitrification process, releasing acids in the process and thus increasing the acidity of the topsoil (Figure A2.4). When acids or bases are added to the soil, organic matter reduces or buffers the change in pH. This is why it takes tonnes of limestone to increase the pH of a soil significantly compared with what would be needed to simply neutralize the free H present in the soil solution. All of the free hydrogen ions in the water in a very strongly acid soil (pH 4) could be neutralized with less than 6 kg of limestone per hectare. However, from 5 to more than 24 tonnes of limestone per hectare would be needed to neutralize enough acidity in that soil to enable acidsensitive crops to grow. Almost all of the acid that must be neutralized to increase soil pH is in organic acids, or associated with aluminium (Al) where the pH is very low. However, with large values of soil organic matter, the pH will decrease less rapidly and the field will have to be limed less frequently. A lime application of 1-2 tonnes/ha every 2-3 years might be sufficient to regulate the acidity. Organic matter may provide nearly all of the CEC and pH buffering in soils low in clay or containing clays with low CEC. In comparing conventional and conservation tillage in Brazil, the highest values of soil CEC and exchangeable calcium (Ca) and magnesium (Mg) were found in legume-based rotation systems with the highest organic matter content (Figure A2.5). In particular, systems with pigeon peas and lablab resulted in a 70-percent increase in CEC compared with a fallow/maize system. Organic matter releases many plant nutrients as it is broken down in the soil, including N, phosphorus (P) and sulphur (S). Leguminous species are very important as part of a cereal crop rotation in view of their capacity to fix N from the atmosphere through symbiotic associations with rootdwelling bacteria. 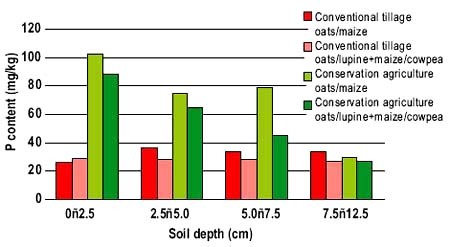 Again in Brazil, five years after starting an intensive system in which oats and clover were rotated with maize and cowpea, there was 490 kg/ha more total soil N in the 0-17.5-cm soil layer than under the traditional oats/maize system with conventional tillage. After nine years, no tillage in combination with the intensive cropping system had resulted in a 24-percent increase in soil N compared with conventional tillage. 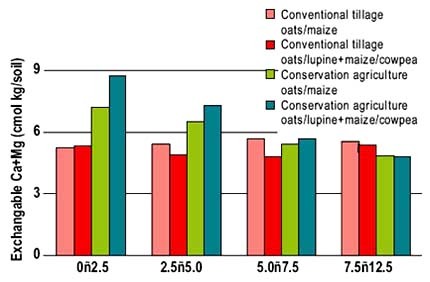 Although N uptake by plants was less in no-tillage systems, probably because of N immobilization and organic matter building, the maize yields under the different tillage systems did not differ. As the no-tillage system was more efficient in storing soil N from legume cover crops in the topsoil, in the long term this system can increase soil N available for maize production (Amado, Fernandez and Mielniczuk, 1998). Calegari and Alexander (1998) noted that the P content (both inorganic P and total P) of the surface layer (0-5 cm) was higher in the plots with cover crops after nine years. Cover crops were shown to have an important P-recycling capacity, especially when the residues were left on the surface. This was especially clear in the fallow plots, where the conventional tillage plots had a P content 25 percent lower than the no-tillage plots. Depending on the cover crop, the increase was between 2 and almost 30 percent. Even more important is the effect of land preparation on the increase of P availability in the soil (Figure A2.6). Note: P content of the soil (0-10 cm) was 9 mg/kg in 1985. Three to five years after initiating an intensified production system, both P and potassium (K) can be accumulated in the topsoil. 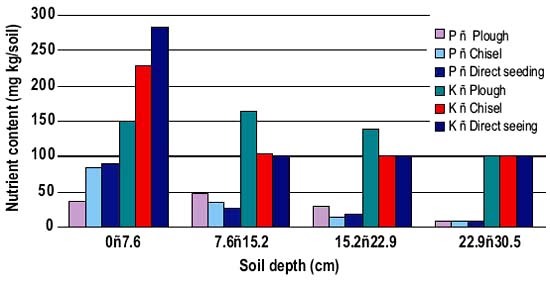 Figure A2.7 shows that ploughing leads to an even distribution of the nutrients in the soil profile, at least in the upper 20-30 cm (ploughing depth). On the other hand, where direct seeding is practised and the crop residues are left on the surface, 50-75 percent of the nutrients were concentrated in the top layer of the soil. Organic matter influences the physical conditions of a soil in several ways. Plant residues that cover the soil surface protect the soil from sealing and crusting by raindrop impact, thereby enhancing rainwater infiltration and reducing runoff. Increased organic matter also contributes indirectly to soil porosity (via increased soil faunal activity). Fresh organic matter stimulates the activity of macrofauna such as earthworms, which create burrows lined with the glue-like secretion from their bodies and intermittently filled with worm cast material. Surface infiltration depends on a number of factors including aggregation and stability, pore continuity and stability, the existence of cracks, and the soil surface condition. Organic matter also contributes to the stability of soil aggregates and pores through the bonding or adhesion properties of organic materials, such as bacterial waste products, organic gels, fungal hyphae and worm secretions and casts. Moreover, organic matter intimately mixed with mineral soil materials has a considerable influence in increasing moisture holding capacity. The quality of the crop residues, in particular its chemical composition, determines the effect on soil structure and aggregation. The effects of the management practices depend largely on the agroclimatic situation as temperature and moisture influence speed of decomposition and general cycling of organic matter and nutrients. Reduced input costs: reduced fertilizer needs owing to improved nutrient cycling and reduced leaching from the rootzone; reduced pesticide needs owing to pest-predator interactions among organisms and natural biocontrol; reduced tillage costs owing to reliance on biotillage by macrofauna under conservation agriculture approaches. Improved yield and crop quality: soil organic matter and soil biodiversity contribute to improved soil structure, root growth and mycorrhizal development, access to water and nutrients and hence improved root and tuber development and aboveground plant production. Improved soil and crop health reduce impacts of disease-causing organisms (pathogens and viruses and harmful bacteria). Pollution prevention: soil organic matter enhances biological activity of soil organisms that detoxify and absorb excess nutrients that would otherwise become pollutants to groundwater and surface water supplies. Soil organic matter is an important means of C sequestration, and organic matter management practices contribute to C storage (up to 0.5 tonnes/ha/year) and reduced greenhouse gas emissions. Soil organic matter consists of living parts of plants (principally roots), dead forms of organic material (principally dead plant parts), and soil organisms (micro-organisms and soil animals) in various stages of decomposition. It has great impact upon the chemical, physical and biological properties of the soil. Organic matter in the soil gives the soil good structure, and enables the soil to absorb water and retain nutrients. It also facilitates the growth and life of the soil biota by providing energy from carbon compounds, N for protein formation, and other nutrients. Some of the nutrients in the soil are held in the organic matter, comprising almost all the N, a large amount of P and some S. When organic matter decomposes, the nutrients are released into the soil for plant use. Therefore, the amount and type of organic matter in the soil determines the quantity and availability of these nutrients in the soil. It also affects the colour of the soil. Dead matter constitutes about 85 percent of all organic matter in soils. Living roots make up about another 10 percent, and microbes and soil animals make up the remainder. Organic matter that has fully undergone decomposition is called humus. The origins of the materials after formation of humus cannot be recognized. Humus is dark in colour and very rich in plant nutrients. It is usually found in the top layers of a soil profile. The dark colour of humus absorbs heat from the sun, thereby improving soil temperature for plant growth and microbial activity under cooler climatic conditions. It increases soil fertility as it retains cations and conserves nutrients in organic forms and slowly releases required nutrients for plant uptake and growth. It binds soil particles together; the cementing and aggregation functions improving soil structure and aeration. It acts as a sponge in the soil, retaining soil moisture. Soils with high organic matter content can hold more water than those low in organic matter. It provides food for micro-organisms living in the soil. Mineralization is the process through which the elements contained in organic form within biological tissues are converted to inorganic forms such as nitrate, phosphate and sulphate ions. Humification is an anabolic process where organic molecules are condensed into degradation-resistant organic polymers, which may persist almost unaltered for decades or even centuries. Decomposition is essentially a biological process. Nutrients taken up by plants are derived largely from the decomposition process. Micro-organisms are by far the major contributors to soil respiration and are responsible for 80-95 percent of the total carbon dioxide (CO2) respired and, consequentl,y of the organic C respired (Satchell, 1971; Lamotte, 1989). Therefore, decomposition is a process determined by the interactions of three factors: organisms, environmental conditions (climate and minerals present in the soil); and the quality of the decomposing resources (Swift, Heal and Anderson, 1979; Anderson and Flanagan, 1989). These factors operate at different spatial and temporal scales (Lavelle et al., 1993). 1. Breakdown of compounds that are easy to decompose, e.g. sugars, starches and proteins. 2. Breakdown of compounds that take several years to decompose, e.g. cellulose (an insoluble carbohydrate found in plants) and lignin (a very complicated structure that is part of wood). 3. Breakdown of compounds that can take up to ten years to decompose, e.g. some waxes and the phenols. This stage also includes compounds that have formed stable combinations and are located deep inside soil aggregates and are therefore not accessible to soil organisms. 4. Breakdown of compounds that take tens, hundreds or thousands of years to decompose. These include humus-like substances that are the result of integration of compounds from breakdown products of plants and those generated by microorganisms. The easily decomposable sugars, starches and proteins are quick and easy for fungi and bacteria to decompose, hence the C and energy they provide is readily available. Most of the microbes living in the soil can secrete the enzymes needed to break up these simple chemical compounds. The larger mites and small soil animals often help in this first stage of degradation by breaking up the organic matter into smaller pieces, thereby exposing more of the material to colonization by bacteria and fungi. Some of the energy or nutrients released by the breakdown of molecules by enzymes can be used by the bacteria and fungi for their own growth. For example, when an enzyme stimulates the breakdown of a protein, a microbe may be able to use the C, N and S for its own physiological processes and cell structure. If there are nutrients that the microbes do not use, they will be available for other soil organisms or plants to take up and use. When microbes die, their cells are degraded and the nutrients contained within them become available to plants and other soil organisms. The second stage of decomposition involves the breakdown of more complicated compounds by many fungal and bacteria species. These compounds take longer to decompose because they are larger and are made up of more complicated units. Specific enzymes, not commonly produced by most micro-organisms, are required to break down these compounds. Decomposition only takes place where conditions are suitable. Abiotic conditions have a considerable effect on the rate of breakdown. There must be some moisture available, soil temperatures must be suitable (usually between 10 and 35 °C) and the soil must not be too acidic or alkaline. Decomposition also occurs at higher temperatures, as in composts, or under waterlogged conditions through anaerobic processes. Thus, the types of organisms involved in breaking down the organic matter also depend on the conditions. the number and type of organisms present in the soil. Micro-organisms can access N in the soil more easily than plants. This means that where there is not enough N for all the soil organisms, the plants will probably be N deficient. When soils are low in organic matter content, application of organic matter will increase the amount of N (and other nutrients) available to plants through enhanced microbial activity. The number of microbes in the soil will also multiply, as they can use the organic matter as a source of energy. Where the number of fungi and bacteria associated with the breakdown of organic matter increases, there may be some improvements to the soil structure. Adding organic matter can also increase the activity of earthworms, which in turn can also improve soil aggregation. Amado, T.J.C., Fernandez, S.B. & Mielniczuk, J. 1998. 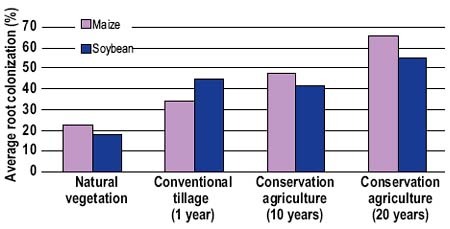 Nitrogen availability as affected by ten years of cover crop and tillage systems in southern Brazil. J. Soil Wat. Con., 53(3): 268-271. Anderson, J.M. & Flanagan, P. 1989. Biological processes regulating organic matter dynamics in tropical soils. In D.C. Coleman, J.M. Oades & G. Uheara, eds. Dynamics of soil organic matter in tropical ecosystems, pp. 97-125. Niftal Project. University of Hawaii, USA. Balota, E.L., Andrade, D.S. & Colozzi Filho, A. 1996. Avaliações microbiológicas em sistemas de preparo do solo e sucessão de culturas. In: I Congresso Brasileiro de Plantio Direto para uma Agricultura Sustentável, pp. 9-11. Resumos expandidos. Ponta Grossa. Calegari, A. & Alexander, I. 1998. The effects of tillage and cover crops on some chemical properties of an oxisol and summer crop yields in south-western Paraná, Brazil. Adv. Geo. Ecol., 31: 1239-1246. Duxbury, J.M., Smith, M.S. & Doran, J.W. 1989. Soil organic matter as a source and sink of plant nutrients. In D.C. Coleman, J.M. Oades & G. Uehara, eds. Dynamics of soil organic matter in tropical ecosystem, pp. 33-67. USA, University of Hawaii Press. Gassen, D.N. & Gassen, F.R. 1996. Plantio direto. O caminho do futuro. Aldeia Sul, Passo Fundo. 207 pp. Lamotte, M. 1989. Place des animaux détritivores et des microorganismes décomposeurs dans les flux dénergie des savanes africaines. Pedobiologia, 33: 17-35. Lavelle, P. & Spain, A. 2001. Soil ecology. Dordrecht, The Netherlands, Kluwer Academic Publishers. Lavelle, P., Blanchart, E., Martin, A., Martin, S., Spain, A.V., Toutain, F., Barois, I. & Schaefer, R. 1993. A hierarchical model for decomposition in terrestrial ecosystems: application to soils of the humid tropics. Biotropica, 25(2): 130-150. Mielniczuk, J. 1996. A sustentabilidade agrícola e o plantio direto. In R. Trippia dos Guimarães Peixoto, D.C. Ahrens & M.J. Samaha, eds. Plantio direto: o caminho para uma agricultura sustentável. Palestras do I Congresso Brasieleiro de Plantio Direto para uma Agricultura Sustentável. Ponta Grossa 1996. 275 pp. Pauletti, V. 1999. A importância da palha e da atividade biológica na fertilidade do solo. In: Fertilidade do Solo em Plantio Direto, pp. 56-66. Resumos de Palestras do III Curso sobre aspectosbásicos de fertilidade e microbiologia do solo em plantio direto. Passo Fundo. Satchell, J.E. 1971. Feasibility study of an energy budget for Meathop Wood. In P. Duvigneaud, ed. Productivité des Ecosystèmes Forestiers, pp. 619-630. Paris, UNESCO. Venzke Filho, S.P., Feigl, B.J., Sá, J.C.M. & Cerri, C.C. 1999. Colonização por fungos micorrízicos arbusculares em milho e soja em uma cronoseqüência de sistema plantio direto. Rev. Plan. Dir., 54: 34.